One day I was reading a topic about Roshan on DA’s strategy section. There was a lot of disinformation so I started so search for information about Roshan to post there. First I searched in newbies guides but they only said that Roshan was a neutral creep who spawns under scourge main tower and drops an Aegis if he is killed. Then I searched on Wiki, but Wiki doesn't have strategy on it, only information about his stats and abilities. Then I found an article about Roshan, but it treated about Roshan’s impact on competitive play. After like half hour searching I couldnt find what I was looking for so it came to me the idea of creating this guide… and here it is, my Guide to Roshan. Roshan the Immortal is a powerful neutral creep. He spawns in a trench off of the central river, just southeast of the scourge main tower. Every time he dies, re spawns 10 minutes later. Gives 15% chance that an attack will deal 50 bonus damage and stun 1.65 Seconds. Block incoming spells every 15 seconds.This is preaty much a Linken's Sphere. Slams the ground, dealing 70 Damage damage to nearby units in a 250 AoE and slowing them for 50% IAS and MS. Last 4 seconds on Creeps and 2 seconds on Heroes. A unit with this skill gains the benefit from being a hero (reduces incoming Spells damage by 25%, cannot be transmuted, cannot be dominated and the duration of spells like Cyclone is reduced to be similar to the duration of the spell when the target is a hero). At the start of the game, Roshan begins with a 0.5 armor Devotion Aura. Every 5 minutes, Roshan Upgraded gains a level and this Devotion Aura gains another 0.5 armor. Roshan also increases his maximum Hit Points by 500 and his ground damage increases by 10. Reflects 20% damage back to melee units attacking it. Note: Available at 4th respawn onwards. Illusions are unable to attack Roshan. All illusions are instantly destroyed. Necronomicon's warriors can't attack Roshan. Roshan will ignore them. 1) Between 105 and 600 gold for the killer. 2) 200 gold to the entire team. 3) 1184 experience: Experience is given in a 1000 AoE from the unit that was killed. In -EM this value is multiplied by 1.5. 4) Aegis of the Immortal: An item with 1 charge of reincarnation. 5) Cheese (after the third spawn): A consumable item regenerating 2500 health and 1000 mana instantly. Roshan appeared for the first time in DotA Allstars 4.00 (during Guinsoo’s reign) reemplacing Morbazan, Eldritch of Oblivion, a hero in the middle of the map related to a quest (like Invoker's quest from DotA Allstars 6.49). He was a boss that never respawned, had 14.500 hit points (nerfed into 13.500 some versions later), very high damage, and very high life regeneration. The original Aegis of the Immortal item was an ordinary recipe item giving 10 armor, 6 strength, 6 intelligence and 33% spell damage reduction for 3075 gold. Some versions later it was buffed and provided 3 charges of reincarnation, 10 bonus armour, and 35% spell damage reduction. The very old Aegis wasnt associated with Roshan. The old Aegis was associated with Roshan through description. Roshan was usually never fought, since the 500 gold bonus per team member (buffed into 800 gold some versions later) from the kill was usually not worth the extremely long fight that the entire team would have to do to defeat the powerful old Roshan. In 6.42 (during IceFrog’s regin), Roshan was changed to a respawning Roshan that got stronger on each reincarnation, and the Aegis was integrated into the Roshan concept as a Roshan drop item with nothing but 1 charge of reincarnation, thus fixing the pointlessness of killing Roshan. In v6.55, Roshan has been changed again to a constantly upgrading Roshan with an Aegis that cannot be stacked and Hurl Boulder (deals 100 damage and stuns for 2 seconds) was removed for Bash. This is a very big nerf to every hero who was able to solo Roshan at early levels because Roshan would have 1500/2000 more HP than before and because Bash is a letal skill for Beastmaster or Ursa (for example) when they try to solo Roshan. This is also a nerf to Aegis because Roshan reclaims the Aegis when he respawn and the Aegis cannot be removed from the inventory. From time to time existed some bugs that allowed some heroes to solo Roshan in early levels without items. 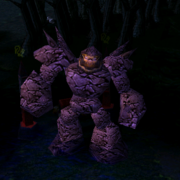 Some examples are Axe in the DotA Allstars 6.00 (there was a bug with Berserker's Call which allowed the player to bring Roshan to the fountain), Venomancer before DotA Allstars 6.48b (there was a bug were you could place Plague Wards outside Roshan’s range) and Lina during DotA Allstars 6.55 (there was a bug involving Lina’s Dragon Slave which would draw Roshan’s aggro allowing any hero to attack Roshan whitout been attacked). * Roshans acts by priority states: The higher priority action is returning to his spawn point if he is issued a retreat order (when he is below 50% HP and nobody is in melee range). * The second higher priority is always attempt to attack a red HP target (20-30%) that is in his melee range. * When there are three or more units attacking Roshan at melee range, it will trigger Roshan to cast Slam. * Like any other neutral creep he will chase things for 600 range, then 3 more seconds and then will make a U turn and go back to his spawn point. This is no longer possible since 6.58 because IceFrog changed Roshan and now he can attack while he spins. I will leave this here as along as 6.57b is the sable map. Roshans acts by priority states. The higher priority action is returning to his spawn point if he is issued a retreat order. The second higher priority is always attempt to attack a red HP target (20-30%) that is in his melee range. On theory, If Unit A is between 0 and 25 % HP Roshan will attack it. Roshan wont do anything other than attacking him unless the said Random Unit A leaves the area (triggering Roshan’s higher priority action) or if his HP is not longer less than 25%. It doesnt matters if Unit A or B are attacking Roshan. So the strat is simple to understand but hard to accomplish. If Unit A runs arround Roshan, he will make Roshan spin and Roshan cant attack while he is spinning. You can run faster than Roshan’s spin because Roshan has an epic collision size, so you can make Roshan spin indefinitely as along you remain under 25% HP on Roshan’s melee range. And now is where Unit B comes in action: he can attack Roshan without been attacked. You need at last 2 units (not 2 heroes, just 2 units) and 2 players. In order to make Roshan spin indefinitely you need at last 160 APM and if you are microing the Unit A you will not be able to select the Unit B and send him to attack Roshan unless your APM is very good (in that case you can do it with only 1 player). Another important thing is what kind of units are you using. Syllabear’s Bear is probably the best candidate for Unit A’s role: 25% of his HP is a lot, also he can die and game wont change and if he is the Unit A, Sylla can be either be Unit B or help Unit B. Unit B needs one and only one thing: he needs to kill Roshan fast. Less time means more profit (time on DotA is gold and experience). I made this Replay in a single player mode. It shows Sylla’s Bear making Roshan spin for a while. This is a Link to an Australian Roshan tournament. This is the Link to the Results. You can see two replays of Lycanthrope using this technique to solo Roshan. Props to m1LkmaN for the information. • Roshan’s early game preformance has been increased thanks to Roshan Upgraded. • The harmless Hurl Boulder has been changed for the letal Bash. I will list most of heroes that can Solo Roshan in early levels. When you are facing them spam –ma and check their inventory whenever you can. When you see they can Solo Roshan place wards on Roshan’s spawn area. I listed the needed skills and items. However, they may need Flasks or Claritys because Roshan’s Bash is gay, in a non homosexual way. Needs: Level 4 Summon Wolves, Level 4 Feral Heart and Vladmir's Offering. Needs: Level 4 Plague Ward. Needs: Level 4 Force of Nature, Power Treads and some sort of regeneration. Needs: Level 4 Holy Persuasion (Centaur, Wolf and Ghost), Level 2 Penitence, Level 1 Hand of God and some auras (Headdress of Rejuvenation, Nathrezim Buckler, Ring of Basilius). Needs: Level 4 Spawn Spiderlings, Level 4 Incapacitating Bite, Level 1 Spin Web, Level 2 Insatiable Hunger and Vladmir's Offering. Needs: Level 4 Fury Swipes, Level 2 Overpower, Level 1 Enrage and Vladmir's Offering. Needs: Level 4 Refraction, Level 4 Meld and Desolator. Some levels on Psi Blades makes things easier but they are not a must. Needs: Level 4 Beast Rage, Power Treads and Helm of the Dominator (dominated Ogre Magi, Ghost or Alpha Wolf). Needs: Level 2 Divide We Stand, Mekansm and Power Treads. Needs: Level 4 Blind, Level 3 Berserker Rage, Level 1 Rampage, Power Treads and Helm of the Dominator (dominated Ogre Magi, Ghost or Alpha Wolf). Needs: Level 4 Raise Dead and Vladmir's Offering. • A team that will live long enought while fighting Roshan for at last 1 minute. • A team that can kill Roshan in less than 1 minute. • Debuff Roshan’s attack (for example, with Miss Change, –IAS skills, etc). • Dont use more than 2 melee units so you dont trigger Slam. • Use Heroes that haves some ability to kill Roshan fast. • Reducing Roshan’s EHP (for example, amplifying your team’s attack, reducing Roshan’s armor, etc). This strat haves two very big problems: First, depending on the lineup it can be very predictable (for example Sylla – Lich – Dazzle – Venom – Ursa exclaims Roshan all over it). Second, Roshan’s spawn region is a very transited area (because a Rune spawn over there). If a team knows the other team is fighting Roshan a team fight will happen. Because of this, Level 1 Roshan is a very gambling strat usually considered a fun strat. However, if teams go inside Roshan’s spawn region fast and if they dont choose a predictable lineup they can succeed. For example, “ Rikimaru – Vengeful Spirit – Lich – Dazzle – Beastmaster “ is not weird lineup and it does not exclaim ROSHAN all over it. The keys to succeed are speed and discretion. There are several combinations which can accomplish this. You can try them by yourself in single player mode. I listed most of the heroes that have some ability to give your team more time or damage Roshan a lot. By tanking I mean something that can resist Roshan’s attack giving your team more time to fight. 40 seconds duration - 5 seconds colddown - 25 mana (273 starting mana) - Adds 3 armor and slows melee attackers'attack speed by 20%. Healing your team’s hit points gives them more time to finish Roshan. I listed all the viable ones, however, some of them are better than others. 10 seconds duration - 125 mana (208 starting mana) - Heals 300 HP over 10 seconds in the 300 AoE. Miss is in fact a debuff that gives the attacker a chance to miss an attack, thus making the attacked unit dodge the attack. Basically, there are two Base Abilities that incurs Miss. One is Curse, which is single-targeted and makes the target miss by chance; the other is Drunken Haze, which is an AoE skill that makes all targets in the area of effect miss by chance. Miss debuffs usually don't stack with each other because they are based on the same spell. By debuffing Roshan with Miss Chanse you are decreasing his attack, giving your team more health and time to kill him. Some heroes haves abilities that can either damage Roshan a lot or increase your team’s damage. By reducing Roshan’s armor you are increasing your team’s attack. For example, with 3 armor reduction you will remove 4200 EHP from Roshan. Description: Roshan killed at 2:40 mark with 4 people. Description: Roshan killed at 2:00 mark with 5 people. Description: Mouz main problem was they did their strategy very obvious (choosing everything very fast + Sylla) and didnt succeed because of it. This is a Link to an Australian Roshan tournament. This is the Link to the Results. You can see three replays of teams soling Roshan before the 2 minutes mark. Props to m1LkmaN for the information. Well, that’s about it. I hope it helped! Apologies if you don't like my guide, since this is my second guide and I don't have very good English. Also, I reserched most of the information by myself so it may not be 100% correct. May want to add secret item drops to the history part. Very good man keep it up! ursa warrior (with fury swipe, don't stop attack or the tank (spirit bear) will die and no more tanker! How long did you spend researching? you can kill roshan with ursa once youre lvl 4. 2 fury swipes and 2 stats. Took about 3-4 mins killing roshan. I think drow ranger would be the best choice for B. If she is over level 11 and has farmed some nice items, she will have awesome dps and can slow down roshan at the same time!